LD Bell grew up playing ball in Tallassee. 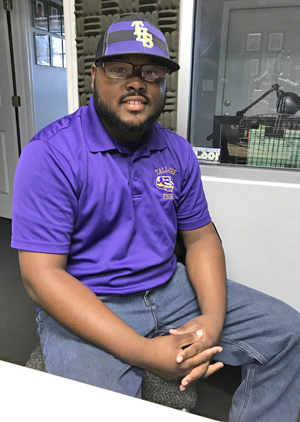 Now 26, Bell is mentoring the next generation of youth in the Tallassee community. "I played basketball, football and soccer," he said. "I graduated in 2010." The former Tallassee Tiger has started the organization Star Seeds. "Star Seeds started in my neighborhood. It was four young men that were shooting basketball everyday at their grandmother's house. I decided to start a youth mentoring program with these four guys. Now we're up to over 100 kids. God is good." 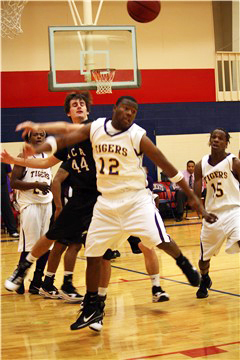 This past season, Bell coached three different teams in the Tallassee Recreation Youth Basketball League. "Star Seeds started about four years. Basketball made it grow." Bell recruited players from the high school team to come out on Saturday mornings for games. "That's part of their community service," Bell noted. "A lot of people think of community service as picking up trash. We think it's giving back to the youth. Positive energy has gotten us bigger." One of the mentors is Tavarious "Truck" Griffin, who will be a senior on the THS football team next fall. "Truck is doing football training right now. These kids are doing a lot of work." Bell sees the cycle continuing in the years to come. "If I mentor them, they mentor Southside Middle School, Southside mentors the elementary school, then it's going to keep going. It's a brotherhood for life." Bell during his senior year in high school. Photo by Graham Dunn. Bell now coaches two travel league basketball teams. "We leave Saturday morning to go to Georgia at 7:00. We're coming back Sunday because Truck's got us in a kick ball tournament." Star Seeds will be featuring youth athlete profiles of different athletes from various sports throughout the year on its website. "I want people to understand we're not ranking players. We're picking five kids week to week," Bell explained. "(Chase) Webster hit (four) homeruns. He's probably the number one player in that league. We don't look at it as a ranking. Next week, we may have five more kids that never made the list. They might have a good performance. I want to tell people to calm down a little bit. It's going to change Sunday to Sunday. "We're going to do interviews with these kids. We'll be doing youth football and youth basketball. We're going to be at the Reeltown league. We just hope we have enough people to go out and watch these games. We just want everybody to bear with us because we're only human." To see this week's Star Seeds Baseball Profiles, click this link: www.starseedspresents.com.